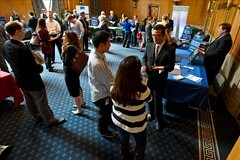 START was among the Department of Homeland Security Centers of Excellence (COE) that visited Capitol Hill last month to discuss how current data and analyses from the centers are being leveraged by the practitioner and policy communities and to educate future homeland security leaders. START Executive Director Bill Braniff and other COE leaders met with congressional staffers and spoke about the value of the centers and their individual research capabilities. The center leaders emphasized how the centers are maturing and transitioning academic research to applied use in the homeland security enterprise. 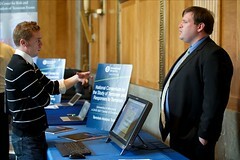 The centers also demonstrated some of the technologies and resources they provide. Brandon Behlendorf, START senior researcher, gave guided tours of the Global Terrorism Database and showed users how to manipulate information on more than 98,000 terrorist events around the world.